Pork ramen is a very rich Japanese dish. It consists of ramen noodles, bacon chunks and pork shoulder, but the most important component is the chicken soup stock with added mushrooms, carrots, celery, garlic, onions and soy sauce. The meat itself is seasoned with chili, soy sauce, brown sugar, and sesame oil. The dish also includes marinated eggs. Depending on the recipe, cooking time can range from an hour to six hours. Pork ramen is very savory and nutritious, but not really a fitting meal for someone who is trying to lose weight. However, the dish may be adjusted to the needs of dieting, if prepared without bacon, and with a minimal amount of lean pork. 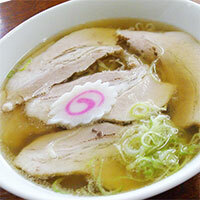 The calories in Pork Ramen per 643.6g(1 cup) is 483 calories. Pork Ramen is calculated to be 75Cal per 100 grams making 80Cal equivalent to 106.67g with 74.34g of mostly carbohydrates、27.87g of protein、6.37g of fat in 643.6g while being rich in vitamins and minerals such as Sodium and Selenium.